From the cuban classic comes this awesomely refreshing variation, the raspberry mojito. As if the mojito itself wasn’t good enough, now take it to the next summery level by adding raspberries. As with most drinks, there are slight variations in the preparation methods for this drink. We’ll list the most popular method of making the raspberry mojito and then we’ll get into some other tips and tricks you may want to try to better enhance the flavour, look and overall drink experience. Take the muddler and gently crush all the ingredients together (this releases the oils of the mint leaves and the juice of the raspberries and limes). Top off the glass with club soda. The method described above is probably the most common method of making this berry-flavored mojito because it simply involves adding raspberries to the recipe and making it the same way you’d make a regular mojito. However, you may have noticed that the first picture above doesn’t contain any mint leaves in the drink itself. This is a variation of the drink where the drink is prepared the same way you’d prepare a regular mojito, but instead leaving out the raspberries at the beginning (during the muddling process). 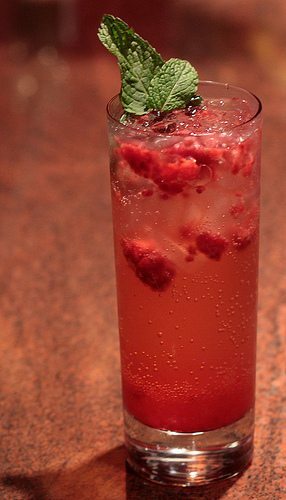 Then the drink is strained into a glass and the raspberries are then added and simply spooned around in the drink to release the color and flavor. This keeps the raspberries somewhat intact and makes the drink more presentable. Although mint leaves floating around in a regular mojito looks good, it doesn’t look as good floating around in a blood red raspberry mojito (as you can see in the picture on the left). Another way to create this recipe is to muddle all the ingredients as mentioned above, and then strain it into a glass using a regular strainer and then strain that again using a finer strainer like a sieve or tea strainer. This eliminates all the little leaves of mint as well as the raspberry seeds so that what you’re left with is a beautifully red- colored and raspberry-mint tasting mojito. 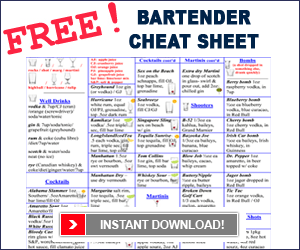 You can check out our other pages on Drink Recipes, like Cocktail, Martinis, Shooter Recipes, Mixed Drinks, Non-Alcoholic Drink Recipes, And everybody’s favourite Tequila Recipes.We also have Video Tutorials on how to make popular drink recipes like the Cosmopolitan, White Russian, Blue Hawaiian, Kamikaze, Hurricane, and the Bloody Caesar.